Save a few sand dollars for your next tropical vacation when you bring big beach entertainment to your birthday party with one of our fin-omenal walking mermaids! No pool? No problem! Our original splash-tacular land-based mermaid party characters were created for Mattel and The Ocean Institute Aquarium to offer a high-energy, fun, educational, and non-swimming mermaid party option to adventurous kids and fans of "The Little Mermaid." Perfect for a beach party, backyard, or indoor event, these walking mermaids are "swell" by themselves or when paired with one of our famous swimming mermaid characters. This party is optimally designed for 15 guests or less per character. 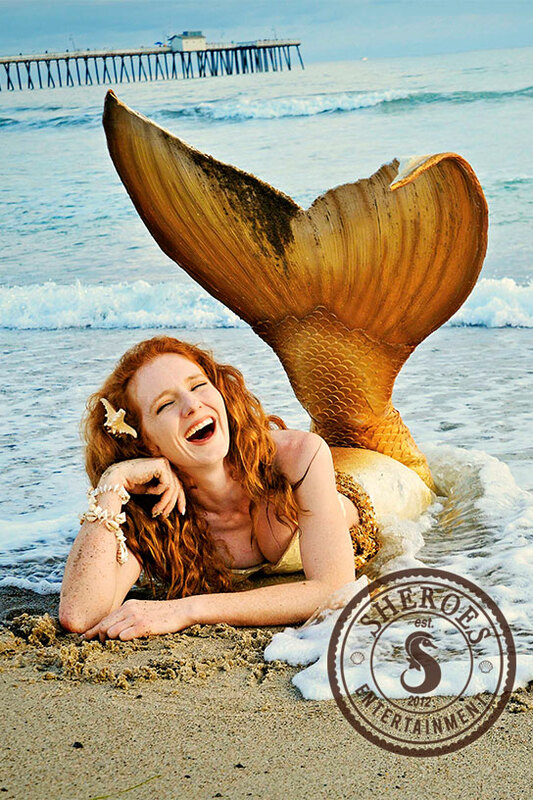 If you are expecting more children add on another character (such as a second mermaid or pirate) to your event. Invite the princess of the seas to your party and be swept away in her fairy tale life of falling in love with her prince and defeating the evil sea witch. Are you done with Disney? Spark your child's imagination with these incredible walking characters. The Avalon packages are designed by our resident marine biologist and aquarium staff members to ensure that kids have fun and learn - all at the same time! These mermaids mix and match games to your party’s duration and your own group's interests, energy level, and abilities to ensure that your party is custom to your group's interests and abilities. Splashtacularly Awesome Ocean & Mermaid Themed Interactive Games Such As Zombie Sharks, Sea Animal Charades, Mermaid Says, The Very Sneaky Octopus, and More! * Order and content subject to change based on party flow and energy level. Face Painting Designs for Kids run 3-8 minutes per face based on complexity. I have some very conservative friends coming. Can the mermaids wear something different? Yes, we do offer modesty tops that are full coverage from wrists to neck that can be worn under their typical swim tops. Can I combine a walking style mermaid with one of your swimming mermaids? Yes, many of our clients will mix and match characters. Please note that swimming mermaid combinations are an additional fee as they appear in their incredible film-quality prosthetics and arrive with a lifeguard for in-water work. Which mermaid will come to my party? Please specify "Mermaid Princess" if you wish for our mermaid in the purple shells and green tail to attend. Otherwise we will send you one of our original, non-commercial, characters.